The ICR-44 Intercom Switching Relay is a Snap Track mounting module for use in harsh environments such as correctional facilities while providing high quality audio communication with complete control. Each unit provides connection for 4 remote intercom speakers with 4 audio destinations. The ICR-44 supports either Sinking or Sourcing Relay Drivers. 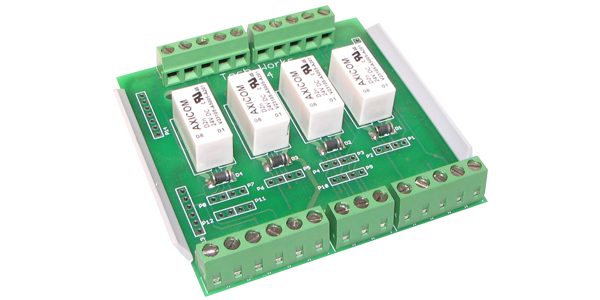 This allows PLC systems to switch or control either the power plus or minus. For convenience, all the ICR-44 terminations are connectorized. All Remote Station connections are via Buchanan type connectors. A matching set of Buchanan connectors is provided on the opposite side of the board for access to the normally open and closed relay contacts. By using the “Back Contacts” multiple masters or priority switching can be achieved. A separate set of Buchanan type screw terminals are available for connection of power, and control for the relays.